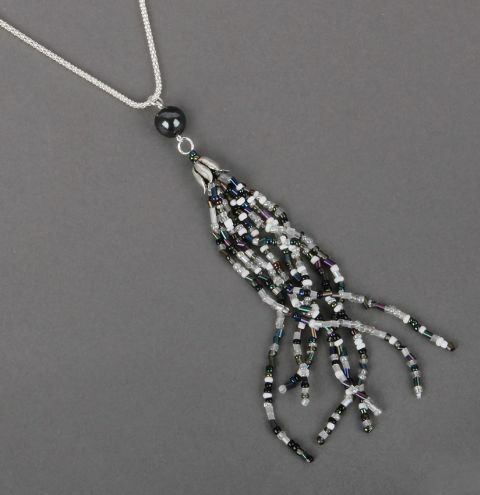 Make a trending tassel necklace using beads from the Pre-Back Friday Clearance! This statement design is everywhere at the moment! Begin by re-stringing one bracelet onto Nymo thread. Once you reach the end, pass the needle back up and through the second hole from the end and continue to weave an inch into the strung beads. Tie a knot onto the thread and continue to weave further up the design. Add another knot for security, weave the tail another inch into the design and trim away the tail. Finish the opposite side in the same way. Repeat with three more bracelets so that you have four strands altogether. Take a gemstone bead, thread it onto an eyepin and make a loop. Close the loop you just made onto a jumpring. Open a jumpring using a pair of pliers and connect it to the bottom loop of the gemstone bead and the seed bead loop of your tassel. Thread your chain through the top jumpring.